Mo's word for Manic Monday is HERITAGE. 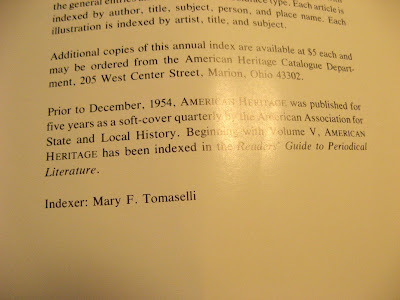 During the 1970s I was the indexer of American Heritage Magazine. 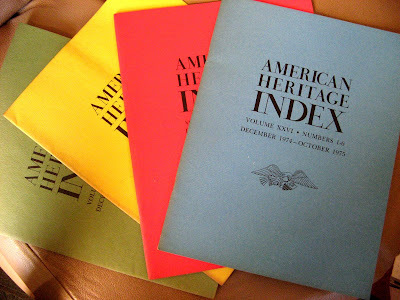 American Heritage was founded in 1954 by James Parton, Oliver Jensen and Joseph J. Thorndike Jr., refugees from Life, who from the beginning broke most of the rules of magazine publishing. They determined not to accept ads, for example — on the ground that there was a “basic incompatibility between the tones of the voice of history and of advertising” — and instead charged a yearly subscription of $10, a figure so steep at the time that readers were allowed to pay it in installments. They also published in clothbound, hardback volumes with full-color paintings mounted on the front. The format was an instant hit with readers, who instead of tossing back issues often shelved them in their bookcases, but it initially confounded the United States Post Office, which decreed that American Heritage could use neither the book rate nor the periodical one. That ruling was eventually overturned, but not until the magazine had almost bankrupted itself by paying for parcel post. The first editor of American Heritage was Bruce Catton, a Civil War historian who wrote in the inaugural issue in December 1954 that “the faith that moves us is, quite simply, the belief that our heritage is best understood by a study of the things that the ordinary folk of America have done and thought and dreamed since first they began to live here.” In the beginning, at least, that meant a fair amount of WASPy nostalgia and a steady ration of stories about the Civil War. That inaugural issue, for example, includes a piece about a Union general who was falsely accused of treason in 1862, as well as articles about the country store, the Fall River steamship line and a lament by Cleveland Amory about the decline of New York men’s clubs. I worked freelance for the company shortly after I got my Master's degree in Library and Information Science from Queens College of the City University of New York. I worked without computers then, using 3x5 index cards on which I wrote author, article title and subjects for each article in each of the issues for the year's volume. I usually produced an estimated 3000 entries per 600-page volume each year. I would alphabetize the cards manually producing a unified (author, title, subject) 3 column, 18-page index for printing in a separate publication. In the early days of indexing, reading the material and marking the pages was a most delightful job but the final alphabetizing of the index cards was tedious and repetitious. There was always a deadline which most of the time was too short. Making one's deadline was most important. I never missed one. I don't index anymore. I teach at a community college now. When I quit I was indexing by computer which had made sorting index terms much faster and easier. You've had an interesting and busy and rewarding life! Isn't it lovely to look back occasionaly to re-visit those places in your life? Great post, Mary, but um...the Manic Monday theme for this week is harvest," not "heritage." I used to love American Heritage, fascinating stuff to this young man in its day. Ah, sheesh. Now I am confused. I just postd mine using Harvest?! Still, you did a very nice post. I remember learning how to use the catalogs and wondering who wrote all the entries and organized the cards. I've always been an organizer too, with my books and music. When I started my own personal library, I tried to mimic the catalog system I learned at the library. I was glad when I got my first computer. It sure made cataloging easier! Super....So breathtakingly beautiful presentation! Good Luck.. I can't imagine indexing without a computer - what a horrendous job! But getting paid to read sounds glorious. Very interesting your remark about history in the early days of American Heritage being WASPy. I think published history still is, pretty much. Or at least written about through European and North American filters. Great post...even if the Manic Monday word was "harvest." harvest is not history....can you keep track of things in your mind?????????? ?i had a reader on my blog said i sounded a little disjointed...now what kind of a word is disjointed???? ?